Winter is here and soon family will be knocking at your door for the holidays. While your cold weather loving relatives will likely embrace the winter wonderland of New York, the west coasters may not be as excited about a visit from Jack Frost. 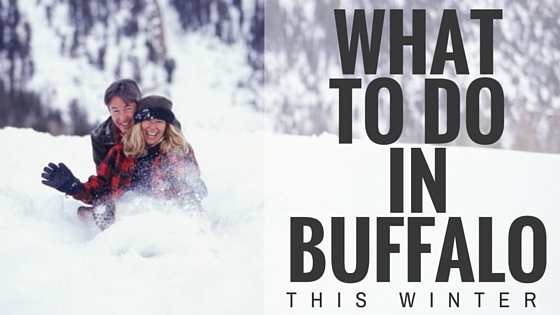 Fortunately there are plenty of things to do in Buffalo that everyone can enjoy. If there’s snow on the ground, pick up a sled or an inflatable snow tube and head to Chestnut Ridge Park. A local favorite, Chestnut Ridge is the largest park operated by the Erie County Department of Parks and offers year-round entertainment with space for tennis and hiking, cross-country skiing and snowmobiling. During the winter, it is the place to be for snow lovers. The sledding hill measures more than 600 feet and features a toboggan chute to really ramp up the speed. And the best part of it all – it’s free! Throw on a coat and pack up the family for ice skating at Rotary Rink at Fountain Plaza in downtown Buffalo. The rink is open Tuesdays – Sundays from now until March 15. Check their website for hours. Use of the rink is free. Chances are your guests have eaten buffalo wings before, but why not treat them to the original – Frank and Teressa’s buffalo wings and Anchor Bar on Main Street. While the origin of the buffalo wing is still debated, Anchor Bar’s story is the most widely known. According to their website, in 1964 Teressa Bellissimo invented the delicious spicy wing for her bartending son, Dominic, and his friends as they arrived at the bar. From that day forward, the wings have remained on the menu and have gained popularity across the world. Show off your hometown pride by taking your visitors to a Buffalo Sabres game. Tickets can be purchased online or at the Key Bank Arena box office on game days. Before heading into the arena, stop by Canalside Buffalo to do some ice skating or, for those who aren’t great on skates, take an ice bike ride around the rink. It’s only $10 for a 30 minute bike rental. In addition to the activities at Canalside, the neighboring Harborcenter offers delicious food and drinks at 716 Food & Sport and shopping at the Shops at Harborcenter. If you’re visiting on a game day, make sure you get to 716 early, as it fills up with Sabres fans a few hours prior to the puck drop. Don’t let the cold temperatures keep you or your visitors inside this winter. Get out and explore all the exciting events and locales that make Buffalo a great place to visit and live!